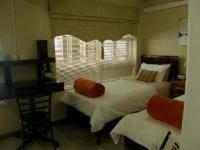 Air Conditioned Room,CAN BE 2, Single or King size bed . 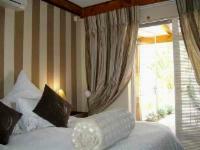 En-suite SHOWER bathroom .Private entrances to to come and go as you please. Facing unto a sparkling blue pool. Sit on the patio and enjoy the gardenview. BouquetDstv, Tea and Coffee.Anemities. 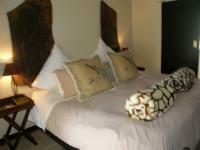 Luxury, King size or twin bed with full en-suite spa bathroom to sooth your tension. Underfloor heating for winter. Aircondition, Hotel Bouquet DStv, Coffee and Tea facilities. Private Patio to relax on with a sundownder to unwind after a hard day.